In Latin, the word corusco means “I shine, I quiver, I flicker”. 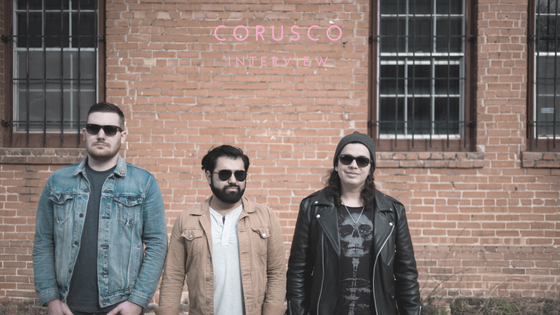 In Texas, the band Corusco conveys the inner battle between dark and light, happiness and sorrow, good and bad - like light coruscating off water. The band originally began as an acoustic project for vocalist Aaron Gonzalez, but once he realized that the songs needed a full band arrangement he brought on bassist Philip Baugh and drummer Carlos Garza. They became a full band in between the writing and recording process of Don’t Give Up, their first EP. Since it was a major learning process on how they work together as a trio, making the EP was less cohesive and more venturing into the unknown. For their latest EP, Wake, they took those experiences and let it help them become better musicians both individually and as a group. The seven-song EP was built around songs written over the course of the last two and a half years and narrowed down to the ones that they felt really reflected who they are and give the best taste of what they want their audience to hear. “It is really a no-nonsense, good rock record and I feel like you can hear the little bits of our personalities all over it,” Gonzalez said. “It really helps to have an objective standpoint to guide the songs where the songs need to go, not necessarily where we as musicians think they should. It really helped them come to life,” Garza added. The title Wake comes from the heavy content of each song and plays off of the same theme as Don’t Give Up which is the idea of waking up to a new day and the different meanings of different pieces throughout the day. The songs were written not only from Gonzalez’s point of view on a personal life event but the point of view of the people that he wrote about and what they were working on in the wake of those same events. Gonzalez describes the band as having different sides – whether it’s dark and aggressive, upbeat and bright or soft and delicate. Each of them use their music as an emotional outlet and really used each other’s strengths to create Wake. It’s a record that they are proud of and a record that they can’t wait for the world to hear.